Chiang Mai is blessed with natural, cultural and religious attractions. The lush green mountains range brings about bewildering attractions such as forests, waterfalls, caves, rivers and gorges, for example Doi Inthanon, Ang Ka Lunag Nature Trail, Borichinda Cave, Ping River, Ob Luang Gorge and many more. As the centre of northern culture, temples were built to throughout the city. Wat Phra That Doi Suthep which is an emblem of the province is highly revered by the residents, Thai people from every region as well as Buddhist from other countries. Other temples such as Wat Suan Dok, Wat Chiang Man and Wat Ku Tao, Wat Chedi Luang, Wat U Mong, Wat Chet Yot also carry precious history, delicate architecture and art. 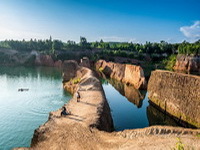 Other attractions include historical places located in the centre and along the river, museum showcases the history and ancient Lanna works of art, ancient Buddha images, war weaponry, zoo, night safari and many more. The old city is the most interesting and historic part of Chiang Mai and where many important temples are located. Back in the 13th century, Old Chiang Mai City was the capital of the powerful Lanna Thai kingdom which ruled the entire region, plus parts of Laos, until the Burmese intervened in the mid 16th century. Remnants of the walls still remain along with city gates and the old moat which was restored in 1800. At roughly the center of the walled city, in the district where the former rulers of Chiang Mai built their palaces, stands the monument to the ‘Three Kings’ – King Mengrai, the founder of Chiang Mai; his contemporary and reportedly good friend King Ramkamhaeng of Sukothai; and King Ngam Muang of Payao. This temple contains supreme examples of Lanna art. A chedi was first built by King Pha Yu (r.1337-55) to house the bones of his father King Kam Fu (r.1328- 37). The original name of the temple was Wat Li Chiang Phra but this was changed to Wat Phra Singh when the Phra Sihing Buddha image was first housed there in 1367. All those who are interest in sightseeing in Chiang Mai must visit Wat Chedi Luang,Chiang Mai which is the most impressive temple in the region. The temple is around six centuries old. The Wat Chedi Luang, Chiang Mai Thailand gets its name from the huge chedi in the temple. Wat Chiang Man is the oldest temple in Chiang Mai, older even than the city. It was the first temple to be built in Chiang Mai. It was constructed during the reign of King Mengrai, who lived in the temple while overseeing the construction of Chiang Mai, the capital of the Lanna kingdom. The temple is located on the highway which rings Chiang Mai, not far from where it intersects Huay Kaew road. It is also very near (within walking distance) of the Chiang Mai National Museum. Wat Jed Yod is probably one of the least visited major temples. Jed Yod translates to “seven peaks” and refers to the seven chedis which top a structure in the temple. 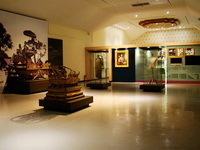 Chiang Mai National Museum is an ethnology museum, which displays many objects about northern Thai history, for examples, statues, fabrics, weapons, models, pictures, texts etc. You will learn most eveything about people in northern Thai history, from their normal life, geology, to types of arts and cultures. Sunday walking street festivals have now become established around Tha Pae with concerts, buskers, stalls, and general street entertainment attracting over 100,000 visitors in high season, reaching a peak in April for the annual Songkran festival. Chiang Mai Art in Paradise is really a fun place to visit, especially if you like photography. Kids will surely enjoy it but it’s just as enjoyable for adults as well. Bring your camera. Take your time. Let yourself get lost in the artistry. It is an absolute blast to play with the whimsical design of this experience and it will leave you amazed and smiling. The Hidden Village can be called as a them park, in fact. It is a peaceful but living tourist attraction. 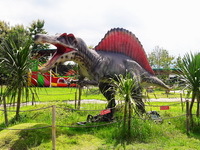 The area was decorated as a fantasy world of dinosours. As soon as you arrive at the place, you should see a series of dinosour statues around you, all of which you can take photos with. Escape from Chiang Mai City – Lazing and Relaxing at Huay Tung Tao Lake. The Lake is a little gem just outside the city that is perfect for chilling out. if you’re looking to escape the busy city. Everyone needs a breath of fresh air every once in a while and whether you just want to relax or engage in activities like swimming, cycling or running. The Tiger Kingdom is one of only two such ventures in the whole of Thailand that allows the visitor an “up close & personal” experience with the tigers, allowing them to play, stroke & take photos in the tigers ACTUAL ENCLOSURE !!. Mae Sa Snake Farm, Chiang Mai is situated on the Mae Rim to Samoeng Road. This farm is the largest snake farm in the region. It attracts the maximum number of crowd as compared to all other Chiang Mai Parks & Gardens. Mae Sa Snake Farm, Chiang Mai has a large collection of snakes. Snake handlers show the general public all kinds of snakes in the farm. Some snakes are nonpoisonous but most snakes here are poisonous. The main highlight of the park is the poisonous Cobra. We invite you to join with wonderful animal at the Chiang Mai Monkey Centre in the beautiful Mae Rim Valley just 20 minutes drive from Thailand’s ancient capital, Chiang Mai. To begin your visit you can stroll around and meet some of Thailand’s more exotic residents including a large number of highly intelligent macaques. If you wish, you can ask one of our friendly staff to let you hold or feed them for moments that make great photos. Maerim Crocodile Show : We’re the first place in Chiangmai and the second place has actress who play crocodile show. We proud to present very exited crocodile show such as catch crocodile show by hand. “Chiang Mai Hill tribe village”, Learn the lifestyle of hill tribe people such as Lahu, Padong and the Long Neck Karen. You will be amazed with their native talents including daily farm work such as making scarecrows, ridding weeds in the paddy fields, and demonstrating rice pouring from the watermill. In the lush tropical jungle of Chiang Mai ‘s Maesa Valley , a big family of elephants lives side by side with their mahout caretakers. “Maesa Elephant Camp” is home to one of the largest assembly of elephants in the north of Thailand. Our philosophy is to create a natural and healthy environment for the elephants while working to conserve and breed them,due to the dwindling number of Asian elephants left in the wild. 20m up in the air, amongst the mountain treetops of the Queen Sirikit Botanical Garden, is Thailand’s longest canopy walkway. Officially opening to the public on 1st December 2015, we were fortunate to have the chance to experience the walkway beforehand and we loved what we saw. If you are looking for a day trip from Chiang Mai I would highly recommend Mon Jam for its beautiful scenery. There literally is no other word to describe this place other than breathtaking. Mon Jam is beautifully landscaped with lots of pretty flowers in the winter months warming to spring. There is a couple of eateries with seats facing the mountain views. You can take a walk around the beautiful mountains with many flower gardens. The atmosphere is very refreshing. 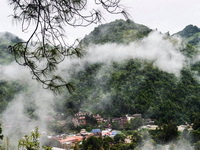 Going up to a mountain may sounds exhausting to you, but not always, especially, at a mountain area named ‘Doi Ang Khang’. At Doi Ang Khang, you will not get tired, exhausted, or something like that. Instead, you will enjoy the atmosphere there so much that you almost forget about everything, as the area is so beautiful and stunning. Mae Tang Elephant Park is situated in the beautiful maetaman valley some 50 kilometers north of Chiangmai and is home to over 40 elephants. Withness the splendor of thesemajestic animals as the herd wallows and frolices in the brown waters of the maetang river and marvel at their size as they emerge dripping and refreshed, just inches away from you. Touch them, smell them, fell their power and talk to them because they are friendly. Select the one you like most and give him a banana, he will be a friend for life because elephant never forget. Chiang Dao Cave Chiang Mai is one of the top-rated tourist attractions in Thailand. This cave extends around twelve kilometers in Doi Chiang Dao Mountain. Only experienced trekkers should venture in Chiang Dao Cave, Chiang Mai beyond the five areas which are Tham Maa, Tham Kaew, Tham Phra Nawn, Tham Seua Dao, and Tham Naam. Every year this cave attracts many tourists to the city leading to the growth of tourism in Thailand. Bua Tong Waterfall and Jedsee Fountain Forest Park is not popular among tourists as it pretty, because it far from Chiang Mai city. Bua Tong Waterfall is a spectacular place to relax and enjoy the day. The landscape of Buatong Waterfall and Jedsee Fountain Forest Park is mountain alternating with valley and brook. Sankampaeng, the village is located 13 kilometers the east of Chiang Mai town in a district that is famous for silk and a cotton weaving. The silk and cotton souvenirs produced in this village are high quality. Factories and souvenir shops selling woodcarving, silverware, earth ware, lacquer ware and cotton fabrics are located along the way from Chiang Mai to San Kamphaeng. A fascinating place is certainly the Muang On cave near the Hotsprings of Sankampaeng. A long staircase leads up to the mouth of the cave. A steep climb down again gives access to a number of caverns filled with impressive stalagmites and stalactites. There is a strange limestone formation that was once mistaken for the skeleton of a dinosaur. In one cavern is a large Buddha image. Sankamphaeng Hot Springs, Chiang Mai is situated about 23 kilometers away from San Kamphang district and about 36 kilometers from the city. The spring is located in the scenic surrounding of the spectacular hills and in the shelter of the large and shady trees. Baan Mae Kampong is a popular natural tourist attraction and also hosts an interesting Community Learning Center. Just an hour’s drive from the city, Mae Kampong village is abundant in natural resources; it has a stream running through it, and a tea-tree forest surrounding it. Wat Suan Dok is one of the oldest temples in Chiang Mai. This temple has been established for 700 years. Wat Suan Dok (Flower Garden Temple) is in the west of old Chiang Mai Thailand . It’s just off the airport road. There are dozens and dozens of small white chedi, about three meters (10 feet) to six meters (20 feet) high. These house the ashes of many of the Chiang Mai Royal Family but the largest one, just to the south, is a Buddhist relic chedi. Wat Umong an excellent place for meditation. 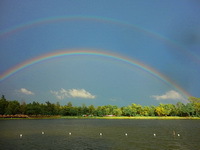 The meditation center hosts meditation classes and Dhamma talks. Wat Umong is unique in many respects. For one, it’s built in the foothills of Suthep mountain and is still heavily forested. But the most unique feature of the temple are the tunnels which give the wat its name (umong is the Thai word for “tunnel”). Chiang Mai Zoo was established by the The Zoological Park Organization, Thailand in 1974. Situated on 531 Rai of verdant forest land at the foothill of Doi Suthep mountain, the zoo is surrounded by hilly terrain which is home to thousands of species of wild plants and flowers adorning the natural landscape of valleys, streams and waterfalls. Wat Phrathat Doi Suthep one of the most important temple in Chiang Mai. The temple is often referred to as “Doi Suthep” although this is actually the name of the mountain it is located on. The temple is located 15 km from the city of Chiang Mai and is a sacred site to many Thai people. You climb your way through winding mountain roads. Cool breezes flow around you. Green forest surrounds. As you rise towards the clouds, you feel a delicious chill in the air. “If you are interested in learning about jade or purchasing jewelry made from jade, Orchid Jade is certainly a place to visit. Orchid Jade does not tolerate any type of treatment on jade. All our jadeite jewelry are Type A and thus we can guarantee that they are of the highest quality. In addition, our jewelry are exclusively made, which means most, if not all, are handcrafted. Doi Pui Mhong Village : The village is about 4 kilometers away from Wat Phrathat Doi Suthep and despite being a key tourist attraction, and therefore probably not as authentic as it could be, it still offers an insight into how Thailand’s tribes live. The villagers wear traditional Hmong clothes, sell traditional Hmong handicrafts, and live in traditional Hmong-style homes. 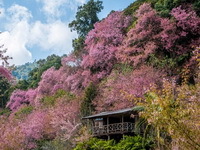 Mhong Khun Chang Kian Village : The very first thing that you need to see at Khun Chang Kian village is ‘Thai Sakura’, or ‘Nang Phaya Sua Krong’. This kind of tree has pink flowers just like the Japanese Sakura, so beautiful and charming! As soon as you arrive at Khun Chang Kian village, you will see a bunch of Nang Phaya Sua Krong trees around. Pink color is all over you like cotton candies. Surely, the atmosphere like this is very romantic. Good to go with your love one. Wiangkumkam (wiang goom garm) was a settlement long before it became King Mangrai’s capital around 1287-90. Frequent flooding caused Mangrai to move, but the place remained important throughout the Lanna period. The site was later buried under mud when the river changed course during the Burmese period. The area was restored as a historical park during the 1980’s. Surrounded by paddy and village houses, the extensive site has a pleasant rural feel, yet it is very close to Chiang Mai. Royal Flora Ratchaphruek is a horticultural exhibition in the city of Chiang Mai where visitors can admire thousands of species of trees and flowers on 80 hectares of landscaped gardens. The park is named after Thailand’s national flower Ratchaphruek with its beautiful yellow blossom. One of the park’s highlights is the orchid pavilion with its countless species of orchids in many colors. The Royal Flora Ratchaphruek is the national flower of Thailand. Chiang Mai Night Safari is essentially a zoo set out like a theme park. For animal viewing it is separated into three main areas. Chiang Mai Night Safari is spread over 819 rai. Traverse the exciting Thailand’s first night safari in the 50-seat open air tram to meet elephants, giraffes, zebras, lions, Asiatic black bears, tigers, hyenas, crocodiles, and many more. The Phrathat Doi Kham Temple is an attractive not much visited temple known for its 17 meters high Buddha image. It is a beautiful temple situated on a lush mountainside near Chiang Mai Town. Phrathat Doi Kham Temple getting more famous because of some person got what they asked for. If you need something but difficult to get it you can come to Phrathat Doi Kham and ask for it. If your ask come true you need to go back offer jasmine flower to the Temple this is about believe. Enjoy the beauty of the local landscape when trail ridding with us first ride or experienced event. You will enjoy your day. Be at one with nature and take back home memories. You will treasure forever..
Baan Tawai is the village of wood-carving handicrafts. It has been known as the major cultural attraction of Chiangmai for Thai and foreign tourists. The best quality and bargains of wood carving items can be found in Baan Tawai. As soon as you arrive at Grand Canyon Chiang Mai, you will feel like it is a water park, but it will look more natural. You will completely forget your old swimming pool. You will not possibily imagine of yourself getting soaked in a beautiful water source in the middle of dirt walls. Doi Inthanon is the highest mountain in Thailand. It is 2,565 metres above sea level. It has many waterfalls and in the forest, at the peak ,are two large stupas built to honour the King and Queen. If you don’t have much time to spare but would like to explore one of the most spectacular national parks in Thailand, we highly recommend here. Khun Wang Royal Agricultural Research Centre is a research station on the slopes of Doi Inthanon has been getting a good deal of attention in the last few years since word got out about it being one of the best places in Chiang Mai to appreciate the beauty of phya sua khrong (wild Himalayan cherry) trees in full bloom in early January. 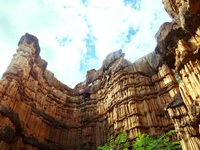 Pha Chor or Pha Choi is at Mae Wang National park, take about 1 hour drive from Chiang Mai city. It’s the new attraction for hiking & trekking. Walk along the walking trail around 30 minute to see the canyon and beautiful panoramic view. Diner on authentic Northern Thai food, sample local delicacies and enjoy the atmosphere of out Lanna Khontoke. You’ll be entertained by a cultural show celebrating the dancing style from every part of the country. including a Candle dance, Faun Tee, Sword dance, Hilltribe dance, Drum dance, Seung kapo, Traditional ramwong, and khon (elegant, stylized Thai drama). People always ask – what is a good purchase and where? Here are some guidelines that may help you. Meditation is not just sitting with the eyes closed and relaxing. There is a major transformation happens to the brain and to the entire field of consciousness. Here are some popular place for do a meditation in Chiang Mai. Although Chiang Mai is filled with extraordinary dining and extravagant gifts, the city’s natural setting reigns as supreme. Chiang Mai is large and busy, which makes its many tranquil parks and gardens all the more appealing. Orchid Farm, Chiang Mai, is situated on the way to Mae sa elephant camp. There are many Chiang Mai Parks & Gardens who aim to conserve the flora and fauna of the region.The main objective of Orchid farm, is to conserve the orchids which are being depleted. Orchids have more than 25,000 species out of which 473 are present in Chiang Mai. Most of the varieties of orchids that survive the climatic conditions of the city are available for viewing at Orchid Farm, Chiang Mai.